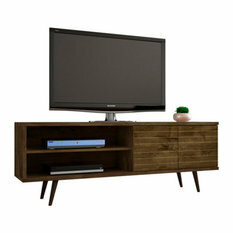 What’s the difference between entertainment centers and TV stands? Although they serve the same basic function, entertainment centers and TV stands have distinct differences that make each one suited for different needs and spaces. 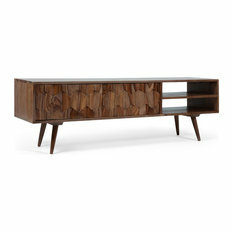 Entertainment Centers: These are large pieces of TV furniture that frame the TV on both sides and often on top. Media centers always include ample storage, whether it be drawers and cabinets or just plenty of open shelving to hold receivers, DVD players and other multimedia. 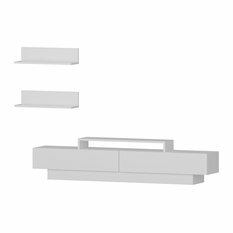 TV Stands: Also known as TV consoles, you’ll set the TV directly on top of these much simpler pieces. 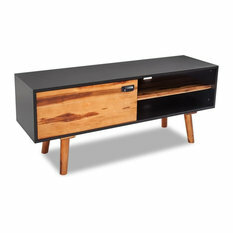 A TV table usually include some storage below, so they’re great for those who want something stylish and functional, yet doesn’t call too much attention to their media collection. 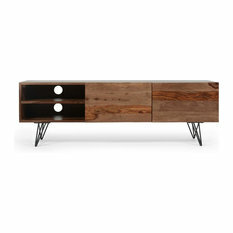 What size TV stand do I need? The size of the media console really depends on how large your TV is. You’ll want the stand to be larger than the television itself, but not so big that it looks disproportionate. 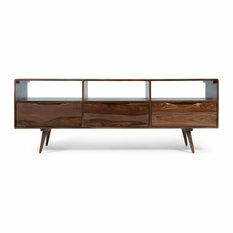 A TV console should be at least three inches wider that the TV. That leaves just one and a half inches on either side of the screen, which isn’t much. If you can spare a few extra inches, a slightly wider entertainment stand is a safer option. That way, you’ll be less likely to knock the TV in passing. Make sure you measure the actual width of the TV too. The size on the box reflects its diagonal width without the frame. 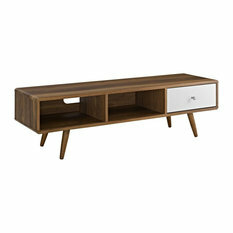 Which features should I look for in a TV console? First, think about the type of television you own and your room’s constraints. 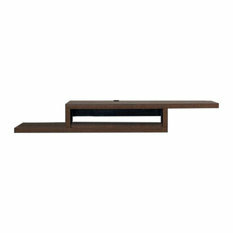 Look for TV stands with a mount to elevate a flat screen off the console’s surface. If you’re working with an awkwardly shaped room, you might want a corner entertainment center or one with a swivel base. A floating TV stand can also make a small space feel bigger. Next, consider how your family uses your TV. Does the storage space meet the dimensions of media components you currently own? If you want to hide all audio/visual equipment, make sure the TV cabinet has doors. Are there holes in the back to run cords and cables to an outlet? Does the entertainment stand in question have adjustable shelves so you can customize the fit for DVDs, cable boxes and speakers of various sizes? Don’t miss out on extras, like a lighted display to showcase decor or a fireplace entertainment center for cozy movie nights in the basement. 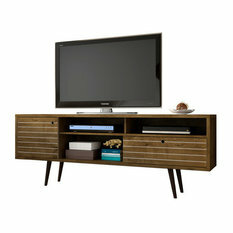 Once you’ve considered all of the options, you’re ready to make your TV entertainment center or media stand purchase!